My expectations were low. 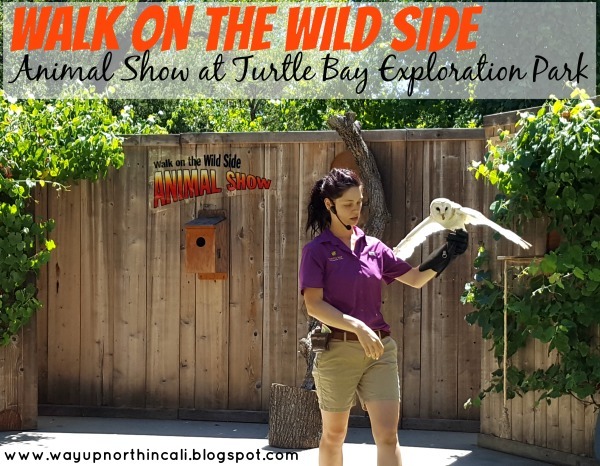 I mean, here we are in little ol’ Redding, how entertaining could the "Walk On The Wild Side" Animal Show at Turtle Bay Exploration Park be? But the girls really wanted to see the show. And my nieces hadn’t been to Turtle Bay for several years, so I agreed. Why not. We are already here. The kids decided front row was the only place worthy of sitting. So we got to the amphitheater about 10 minutes before show time. Not that it would have mattered. Most people wanted the shade farther up in the seats. And that’s where I would have preferred to be. Because it’s freaking hot here in the summer! But we endured. By the time the show started, we were already sweaty. But the kids didn’t seem to care. 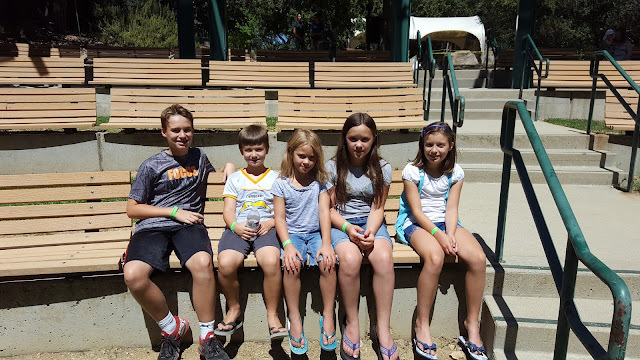 All five of them squeezed together on one bench, even though most of the amphitheater was empty. Just looking at them all smooshed together made me feel like I was melting. "You guys can spread apart." The show started, and once again, Turtle Bay pulled out a quality show. I’m not sure why I always seem hesitant. But the Animal Show at Turtle Bay Exploration Park was very entertaining. The animal handlers were animated and we could tell they enjoyed their job. Their enthusiasm was contagious. Location: Turtle Bay Exploration Park Amphitheater, near the Paul Bunyan Building. All of the animals at Turtle Bay are rescued animals. 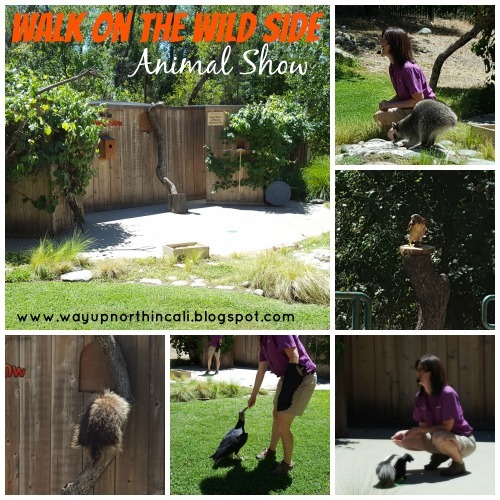 A Fox, Skunk, Raccoon, Eagle, Turkey Vulture, and other fun animals were among the line-up. Most were injured in the wild and unable to be released back into the wild due to their new limitations. I appreciated the explanation of where each animal came from and why they were part of the Turtle Bay animal family. I respect the fact that their animals are rescued and not just snatched out of the wild for our viewing pleasure, as is done in so many zoos and animal parks. Well done Turtle Bay. The show is about 30 minutes long. And other than sitting in the boiling hot sun, it was just long enough that we got to see a variety of animals and just short enough that the kids didn’t get antsy. We did enjoy a few perks of sitting front and center. The animals came quite close to us and at one point the handlers asked us questions and flew an owl right over our heads. Watch the video below to see it! As a parent, I would encourage sitting in the shade if it’s summertime. It was quite toasty out in the sun. Once the show starts, you aren’t allowed to move seats. So be sure you are comfortable where you are. Don’t be late for show time. Once the show starts they won’t let you in the amphitheater. thanks for another great blog post, it makes me want to come to Redding again. Thank Kevin! We would love to see you guys again! Florida is SO far away!